Xiphoid process pain (also called xiphoid syndrome, xiphodynia or xiphoidalgia) affects quite a few people. 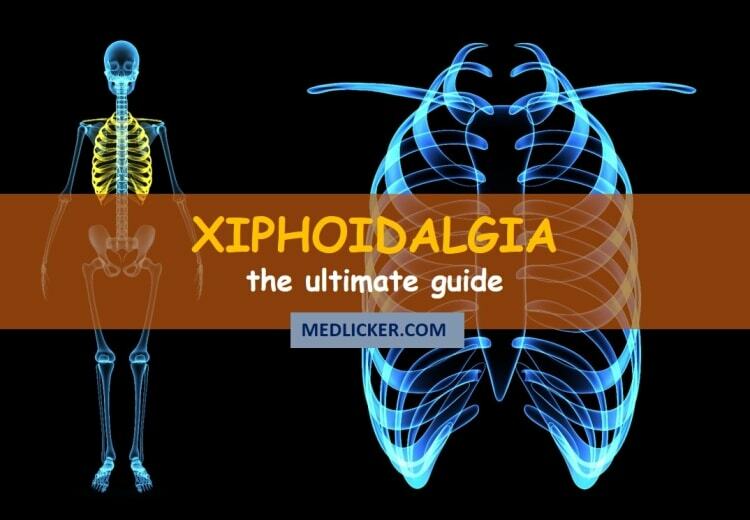 In this post we shall look at what causes xiphoidalgia, what are its symptoms, diagnosis and treatment options. The skeleton system forms the framework of the human body. When a person is born they have 270 bones but by the time they reach adulthood they have 206 bones because many bones fuse along the way. The human skeleton is divided into two parts the axial and appendicular skeleton. The axial skeleton includes 80 bones that consist of the vertebras, the ribcage (ribs and sternum), skull and facial bones. The appendicular skeleton includes 126 bones that consists of pectoral girdle, upper limbs, pelvic girdle and the lower limbs. The human skeleton provides protection of the internal organs, support for body movements. The appendicular skeleton is mostly responsible for the locomotion of the body. The bones in the human body contain bone marrow that makes blood cells. The xiphoid process is a part of the axial skeleton. It is located at the base of the sternum, it is said to be at the level of the 9th thoracic vertebra. The sternum consists of three parts, the upper broad part is called manubrium, the middle part is called the body and the slightly tapered base is called the xiphoid process. The xiphoid process is also called the ensiform process. The word xiphoid has Greek origin and it means “sword like”. The word ensiform has its origin in Latin but it also means “sword like”. In babies the xiphoid process is cartilaginous, its tip can be seen and felt just below the sternal notch. The xiphoid process usually fuses to the sternum via fibrous joint (this joint is called xiphosternal joint) during 15-29 years of age. Around the age of about 40 the cartilaginous xiphoid process becomes ossified. The xiphoid process can sometimes be bifurcated or perforated. These are not alarming sings, these are just morphological changes that are inheritable. The main function of the xiphoid process is to indirectly provide support to the lower ribs through the cartilages in the celiac plexus and act as the point of attachment for many muscles that help make the floor of the diaphragm. Xiphoidalgia means pain and tenderness of the xiphoid process. The synonyms for xiphoidalgia are xiphodynia and xiphoid syndrome. This is a musculoskeletal disorder that has the ability to produce a constellation of symptoms that can mimic a number of common abdominal and thoracic disorders and diseases (1). The topic of incidence ofxiphoidalgia is controversial because some doctors say that it’s a rare disorder while others insist that it is relatively common but is mostly overlooked by most practitioners. The diagnosis of xiphoid syndrome is pretty straightforward but is usually misdiagnose because practitioners usually don’t give it much credence. The xiphoid syndrome can be caused by many different reason but the main cause is fracture due to trauma. The xiphoid process is cartilaginous till it ossifies around 40 years of age, so this makes xiphoid process more susceptible to damage. The symptoms of xiphoid process pain tend to be very varied. Xiphoidalgia is a condition that is commonly overlooked by general practitioners because it is usually associated with some other sever or major disease. The main symptom of xiphoid syndrome is pain in the lower part of the sternum. The pain associated is usually dull and aching. The intensity of pain varies from mild discomfort to severe pain. The other term used for referred pain is “reflective” pain. It is the pain that is felt at a structure that is distant from where the pain stimuli is present. Referred pain present as a clinical conundrum for the practitioners and sometimes this causes a patient to suffer untreated pain needlessly. Referred pain can sometimes lead the practitioners to the wrong diagnosis. Xiphoid syndrome is characterized by the pain and tenderness in the lower part of the sternum. The pain varies in intensity from mild to severe. The pain is dull and aching in nature and is usually spontaneous in onset. The pain of the xiphoid syndrome can be perceived in the deep retrosternal area and epigastrium. The site to which pain of xiphoidalgia can refer are the shoulders and the back. Trauma: Any injury or damage to any biological organism through external physical harm is defined as trauma. The xiphoid process is cartilaginous till the person reaches 40 years of age, when it ossifies. The xiphoid process can be easily fractured or dislocated by trauma. Xiphoid process can be damaged by acceleration injury, blunt trauma to the chest and unusual lifting of heavy objects. The pain of xiphoid syndrome can be aggravated by aerobics and heavy meals. CPR (cardio-pulmonary resuscitation): CPR is an emergency procedure that is done when a person experiences cardiac arrest to help restore the partial flow of oxygenated blood to the heart and bran till further help arrives. If the rescuer applies to much pressure or places the hand in the wrong position for chest compression, they can fracture the xiphoid process. The fractured xiphoid process can lead to xiphoidalgia. GERD (Gastro-esophageal reflux disease): This disease causes damage to the mucosal lining of the esophagus due to regurgitation of gastric content into the esophagus. The esophagus has alkaline medium while the stomach has acidic medium, due to this the gastric content can cause damage to the esophagus. The esophagus and xiphoid process are in close proximity anatomically, this proximity can cause pain in the xiphoid process. The other reason that GERD can cause xiphoid pain is due the triggering of other somato-visceral symptoms like heartburn. Xiphoidalgia is a musculoskeletal disorder and it may or may not be associated with serious comorbid diseases. When a patient comes to the doctor for acute chest pain then they should be evaluated carefully for abdominal and thoracic disorders because acute chest pain can indicate heart attack or angina. The diagnosis of xiphoid syndrome depends on both clinical examination (which includes a proper medical history) and radiological studies. The clinical diagnosis of xiphoid syndrome depends on the complete or partial reproduction of symptoms on putting pressure on the xiphoid process and its surrounding structures. The pain in xiphoid process can also be a manifestation of serious life threating disease like angina, pericarditis or myocardial infarction (MI). Due the recent advancements in the field of medicine there are many imagining (radiological) techniques that can be used to make a diagnosis, the most commonly used imagining technique are the ultrasound and X-ray. Both those techniques are simple and relatively inexpensive. There are many other radiological techniques that help make a diagnosis like MRI and CT- scan but these are expensive. Xiphoid process pain is commonly misdiagnosed due to a variety of reasons, the main reason being that it can produce varied constellations of symptoms. These varied symptoms can be easily mistaken for any number of common abdominal or thoracic disorders. The other reason why doctors sometimes overlook xiphoid syndrome is that it is usually associated with another disease like gall bladder stones or heart disease. Doctors are mostly so busy dealing with the more serious disease that may present along with Xiphoid syndrome that it can be easily overlooked. The doctors are divided into two groups when the topic of incidence of xiphoid syndrome is raised, some say that it is a rare disorder while others think that it is a common disorder but is most overlooked or misdiagnosed. The xiphoid process is the lower most part of the sternum. It is cartilaginous at time of birth and ossifies later in life. In infants the xiphoid process is more prominent then in adults and can be easily felt at the lower border of sternum. As a child grown the xiphoid process becomes less and less visible. But in some adults especially those who have lost a lot a weight, the xiphoid process can be felt. In obese people the visceral fat exerts pressure on the internal organs and ribcage and causes them to expand, since the xiphoid process is cartilaginous it can be pushed out and can seem like something is protruding out from the sternum. As soon as obese people lose a little weight the protruded xiphoid process can be felt. Most people when notice a protrusions on the lower part of sternum think cancer or tumor and panic, while other people just ignore it and hope it might disappear. While most doctors agree that a protruding xiphoid process is not a cause of alarm and contrary to popular belief is normal, still you should consult your GP to confirm whether the protrusion is actually xiphoid process. The other cause to consult your GP is if you feel pain or tenderness in the xiphoid process. Lump on the sternum can also be caused by trauma or accident to the xiphoid process or by a fractured xiphoid process that did not heal properly and is protruding outwards. The first line of treatment for xiphoid syndrome is analgesics (painkillers) and NSAIDs (non-steroidal anti-inflammatory drug). These drugs help relieve pain and reduce inflammation. These drugs help make the person comfortable. If the pain is sever in intensity then is will not be relieved by over the counter painkillers. In this condition opioid analgesic may be advised to help control the pain. Heat application can be used to help alleviate the discomfort and pain caused in xiphoid syndrome. Cold application can also help reduce the discomfort of xiphoidalgia. If pain is not relieved by drugs then lidocaine (local anesthetic) and corticosteroids can be injected into the xiphoid process to help alleviate pain. Corticosteroids not only help alleviate pain but will also help reduce inflammation. While these injections are often curative, the risk of complication often makes the doctors hesitate to prescribe them. The complications include pneumothorax, peritoneal perforation and infection. Physiotherapy of the chest muscles might also prove helpful in reducing pain. Xiphoid syndrome is a musculoskeletal disorder, so it is important to also pay attention to the muscles that attack to the xiphoid process. Physiotherapy helps sooth the pain and tenderness in the muscles attached to the xiphoid process. In the longer run gentle exercise is proved to help improve mobility. Elastic rib belts are also a great way to reduce discomfort caused by xiphoid syndrome. The elastic rib belt provides pressure to the sternum and help to alleviate the pain. If xiphoidalgia is associated with GERD then diet modification is an important part of management. The underlying cause, in this case GERD, must be addressed and treated for the proper management of xiphoid syndrome. If everything else fails to help or if the xiphoid is fractured then it can be removed. The xiphoid process does not have any major function but it does anchor some important muscles. The surgical process that is used to remove the xiphoid process is called xiphoidectomy. It is a complex procedure and can only be done by specialists. It is not necessary to always remove the entire xiphoid process, sometimes only the removal of the extension is enough to treat xiphoidalgia. Xiphoidectomy is a last resort for the management xiphoidalgia and must only be done when all else fails. Xiphoidalgia sometimes may be caused by a number of other medical conditions, so for the proper management of xiphoid syndrome the underlying cause must be addressed and treated. Xiphoid process pain can result in quite a few complications. One of the main complication of xiphoidalgia is nausea and vomiting. These complications arise due to the irritation of the stomach that lies just under the xiphoid process. Xiphoidalgia can cause irritability and altered mood due to the pain and the hindrance that pain causes in the day to day activity. Superior margin of the liver. Lower margin of the heart. Central tendon of the diaphragm. Lower limit of the anterior thoracic cage. Pericardiocentesis (pericardial tap) is a surgical procedure in which the fluid accumulated in the pericardium (the sac that surrounds the heart) is aspirated (e.g. drained). The collection of fluid in the pericardium is called pericardial effusion, this can be caused by a number of things. The main causes of pericardial effusion are chest trauma, infection and heart disease. The fluid buildup in the pericardium is a life threating condition. Pericardiocentesis is a procedure in which a large needle is inserted into the pericardium and the fluid is aspirated to relive the pressure. The xiphoid process is an important landmark that helps dictate the position of insertion of needle. Ultrasound is mainly used to help guide the needle. Anatomically the needle is inserted along the xiphoid process and guided upwards and leftwards towards the heart. The xiphoid process helps guide the needle and helps prevent any potential damage to the lungs if the needle is inserted at the wrong angle or position. CPR (cardio-pulmonary resuscitation) is an emergency procedure that is performed in order to preserve brain function manually until further steps can be taken to restore proper blood circulation and breathing in a someone who has suffered a cardiac arrest. CPR alone is not likely enough to restart the heart. The main purpose of CPR is to restore the partial flow of oxygenated blood to the brain and heart. This helps prevent tissue damage till help arrives. Most jobs in health care or child care sector require the employees to have basic training of CPR. CPR is a combination of chest compressions and mouth to mouth breathing in a ratio of 30:2. The ribcage (ribs and sternum) are specifically designed to help prevent injury to the underlying organs. But like everything the ribcage has its breaking point, if the pressure applied is too forcefully then the ribs or sternum could fracture and damage the underlying organs. The most common complication of CPR is the fracture of the xiphoid process. This occurs mainly due to the wrong placement of the rescuer’s hand, the hand is placed inferiorly than is advised. The xiphoid process is cartilaginous and can be fractured easily if significant pressure is applied. A distinct “pop” sound is heard when the xiphoid process is fractured. The fractured xiphoid process can dislocate and it may puncture the liver, which can lead to sever internal hemorrhage. See numbered references within the article body.